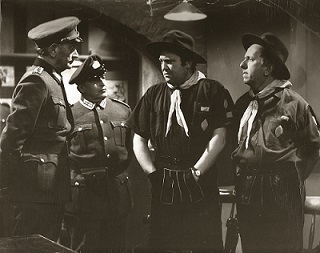 Following their return from an overseas cruise, Terry (Terry Scott) and Hugh (Hugh Lloyd) soon find themselves in the offices of MI5 where they're recruited as a pair of secret agents. Bumbling and fumbling their way through escapades involving Chinese dope fiends, plots to drug England's tea supply and mistakenly parachuting into East Germany instead of West. Working alongside Terry and Hugh are fellow agents Bushbaby (Aidan Turner) and Studley (Rex Garner). Hugh and I ran for six series between 1962 - 67 before writer John Chapman decided to call time on the partnership. However, less than a year later, he decided there was still mileage in the duo and drafted them into a world of espionage in Hugh and I Spy, the title itself being a knowing nod to the US TV series I Spy. Terry and Hugh were more than up for a reunion as Terry noted when he said "The trouble when you're on your own is that people are always saying: where's the other one? They think they are only getting half their money's worth". Hugh and I Spy aired on BBC1 in early 1968 on Monday evenings in the 7.30pm slot and consisted of six 30-minute episodes. The series received only one solitary airing and was never repeated. Terry and Hugh's popularity, along with a reliance on overseas programming, meant that Hugh and I Spy also travelled to Australia where the series aired on ABV-2 in 1969. As with so much British programming of the era, Hugh and I Spy was wiped out of existence in the early 1970s. However, in 2013, the final episode of the series - 'Tea or Coffin' - turned up as part of a collection for sale on Ebay and has now been safely preserved. Terry Scott and Hugh Lloyd are one of those wonderfully British comedy duos whose pairing still resonates through to the world of contemporary comedy - just look at Mitchell and Webb in Peep Show who, despite their self professed authority, are ultimately the most clueless individuals in any narrative they find themselves in. You could say this comedy archetype goes back even further - such as Laurel and Hardy - but Terry and Hugh are a wholly British take along with The Likely Lads. Anyway, the comedy force is strong in Terry and Hugh, so it's always a delight to see them in action. Just over a 1/3 of the Hugh and I catalogue exists and, whilst this is better than nothing, it still feels like a travesty that a sizeable chunk of the 1960s British comedy landscape has been obliterated out of existence with a carelessness more readily associated with waiters at Frankie and Benny's. And, for so many, many decades, it was believed that Hugh and I Spy had been completely destroyed - much like any meal at Frankie and Benny's - so this was even more galling than Hugh and I's fate. Hope springs eternal, though, and eventually we've been rewarded with a snapshot of Hugh and I Spy. It's not necessarily easy to view 'Tea or Coffin', but the TV preservation experts at Kaleidoscope recently put on an event which - amongst a whole treasure trove of rarely seen delights - included this snapshot of Hugh and I Spy. As you might have guessed - otherwise this article would be highly devoid of detail - I attended this event and lapped up the comedy stylings of Terry and Hugh. Naturally, given the fact that Hugh and I Spy aired almost 50 years ago, a certain level of dating that has to be acquiesced. There's a cosy level of comedy on offer and it's elevated by the comedy bickering provided by Terry and Hugh's well honed and perfectly balanced chemistry, but it would be foolish to suggest that when Hugh and I Spy flexes its comedy muscle that every sinew is stretched to breaking point. This being 1968, though, means that Hugh and I Spy aired in an era when so many comedy boundaries were yet to be smashed that expectations and tastes were more measured. Importantly, though, Hugh and I Spy, is still funny and contains genuine laughs that have withstood the rigours of 50 years of social and cultural changes. Sure, some feel like guilty pleasures now - I caught at least two gags centred around 'horrifying' insinuations that Terry and Hugh were more than just good friends - but there were plenty of fine setups such as a timebomb being passed backwards and forwards unknowingly in Terry's suitcase and Terry and Hugh portraying a pair of sedated 'corpses' was written and performed by a team who knew how to wring every last ounce of comedy from a scene. Perhaps the best lines were reserved for Fred Emney who appeared in several episodes and is given the codename Chihuahua for 'Tea or Coffin'. A great, deluded twit in the greatest British comedy traditions, Fred Emney - looking like Winston Churchill's doppelganger here - is perhaps even more bumbling than Terry and Hugh and is one of the highlights of the episode. For some reason, I also found Hugh's feigned condition of "twinges in the Ganges" far funnier than I should have done, but even an innuendo which doesn't even make sense can still be highly fun at the right moment. "Unless you happen to be very well off, you have to have a second job or your own business. There aren't enough roles to provide full time employment. Some producers even give Asian roles to English actors who then speak their lines with an I instead of an R"
Obviously, I've only viewed one episode - and this may remain the case for all eternity - but it was a highly enjoyable watch and provided further proof that Terry and Hugh were comedy performers of some renown. A wholesome sitcom that, despite the obvious dating, retains that magisterial handling of comedy narrative and has left me wanting to see more. The level of available detail surrounding the series is fairly minimal - hence the number of gaps in my coverage - so if you've got any more insights and information get in touch! *The still at the top of this article comes from the British Comedy Guide's rundown on the series.